The thrill that never gets old: seeing your novel in print for the first time. I was so excited last week to receive my first ever print copy of Daughter of Aithne, Book Three of The Silver Web. Ironically, this was not the first print copy delivered, even though I ordered direct from the printer. Two critique partners of mine who ordered their copies through Amazon received Daughter of Aithne several days before I did. So there you go. Amazon delivers faster than the printer itself! It was especially great to see Daughter of Aithne united with the first two novels in the series, Eolyn and Sword of Shadows. Don’t they make a handsome trio? Credit for the cover art and design goes to Thomas Vandenberg, who has been working on this project a long time and has done an amazing job! Official release date for Daughter of Aithne is in just over a week, on May 1. The novel is available for pre-order in both Kindle and paperback formats; and apparently, if you order the paperback, you will have your copy inside of a few days – ahead of the release! Sisters united at last: Eolyn, Sword of Shadows, and Daughter of Aithne. Interested in what readers have to say? There are already a couple of independent reader reviews posted on Goodreads! As these reviewers will attest, you can read Daughter of Aithne without having read the first two books in the series, but trust me: You will have a much richer experience if you indulge in the full journey by starting with Eolyn. Speaking of Eolyn, the Goodreads giveaway for Book One of The Silver Web ended earlier this week. The winners’ copies are packaged and ready to go to the post office. 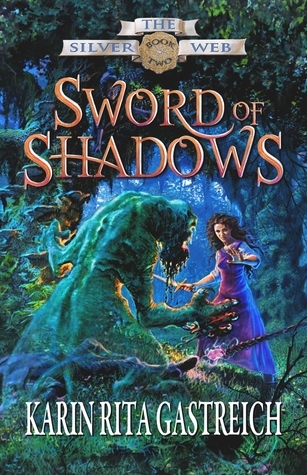 If you’re looking to try your luck again, I’m running a second giveaway for Sword of Shadows, Book Two of The Silver Web. Five signed copies are up for grabs. You can enter the giveaway by visiting Goodreads or by clicking the link at the end of this post. On May 1, I will launch a two-week blog tour with Bewitching Book Tours. In addition, there will be a book blast with Goddess Fish Promotions. Both tours include gift card giveaways and other surprises, so be sure to check back for the full schedule. Summer is just around the corner, and it’s time to celebrate with some new reading! The Silver Web trilogy: A fine addition to any bookshelf. True connoisseurs will also recognize the first edition of Eolyn in the upper right hand corner.